I’m always enormously flattered when, if only for two minutes, I am mistaken for a real Italian. As the daughter of two foreign language teachers, my Italian pronunciation is not half bad. Of course, as the daughter of two foreign language teachers, I also have an aversion to sitting in a language class. So as soon as I get three sentences out, my conversational grammar immediately notifies the listener that I clearly learned Italian over many late night glasses of Lambrusco with Reggiani… NOT in a classroom. But oh well. For those first 2 minutes, I am beaming! Very different meanings, with potential for catastrophic confusion! Now, I am a visual person, so the photos are to help me associate pronunciation with each meaning. Hopefully this will help someone else as well. Let’s take papà first. Father. Ok… short on the first syllable, and hard accent on the second. Let’s associate that with something to help remember. Like a gunshot from the Godfather movie! It’s like saying pa-pow, with the rhythm of loading a shotgun. Side note: After I wrote this, my husband suggested a far better visualization – the noise a cork makes when it pops out of the bottle of celebratory Spumante when one becomes a father. He also pointed out that a real Godfather doesn’t touch the guns himself; that’s what his lackeys are for. He also pointed out that growing up in Texas probably had an effect on me. 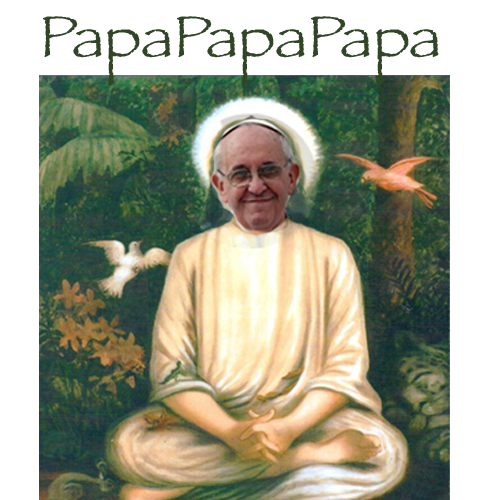 Ok, next there’s the Pope… Capital P for Papa. The key to the correct pronunciation of this word is to maintain equal emphasis on both syllables, or lean a bit more on the first. Spinning off of the religious theme, I’m using the ideal of a spiritual chant to help me remember this – constant, unchanging, meditative. 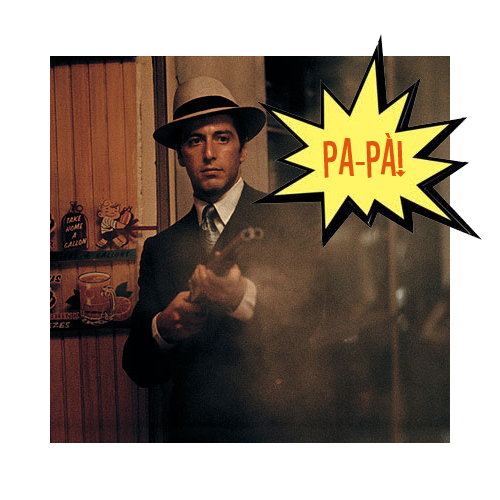 Last, but certainly not least, we have the hardest one – pappa. The doppia in this one makes it difficult for us lazy mouthed Americans. They actually want us to pause, linger, hang out a bit… on the pp. First of all, what the heck is the stuff? Well, it’s baby food. But it’s Italian baby food. So it’s not some nasty, industrial mix of pear gook and peach slush. It’s chunks of bread dough soaked in broth and tomatoes, lightly dressed with olive oil and perhaps a bit of garlic and basil. They start ’em early, I’m tellin’ ya! I struggled with an image for this, but in the end I decided to play on the idea that I need to remember to … pause … when I get to the peas. Oops, sorry, the P‘s. So, here’s some pappa… with a pause for the addition of some peas (which would probably not taste so bad, really). Ok, I’m done with my little visualization exercise. Am I the only nutcase English-speaking expat who has problems with these words? Better question – am I the only nutcase who uses visualization techniques? ← How to handle an encounter with a cinghiale (an Italian wild boar). This is a great idea for visual learners! I’m definitely not — the only way I really remember anything is by writing it down several times. youre a smart nutcase ysing the visualization technique! my italian and i are trying to make our memories better by using it. your pics certainly helped me distinguish between them! i try hard on the doppia and pronounce the doubles pretty well now, but the gli sound is killing me. and for some reason, i have a mental block on which prepositions go where. ugh!